My sewing machine and I had our first rendezvous in a long while today while Tessa was napping. I put on Radiohead's Live from the Basement: The King of Limbs (listen to this, please: it's so pretty) and the light was bursting into the living room so I sat there in the sunlight to do my measuring, cutting and photo-taking. It was bliss I'm telling you. 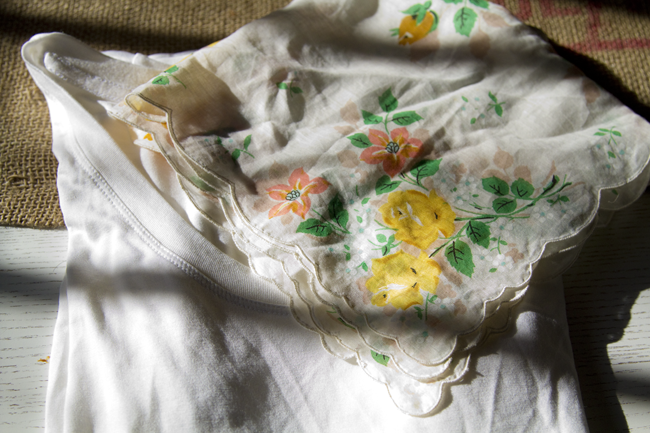 And I got to do this project, which I've had in mind for months, ever since I found this sweet vintage handkerchief and imagined it as a collar. 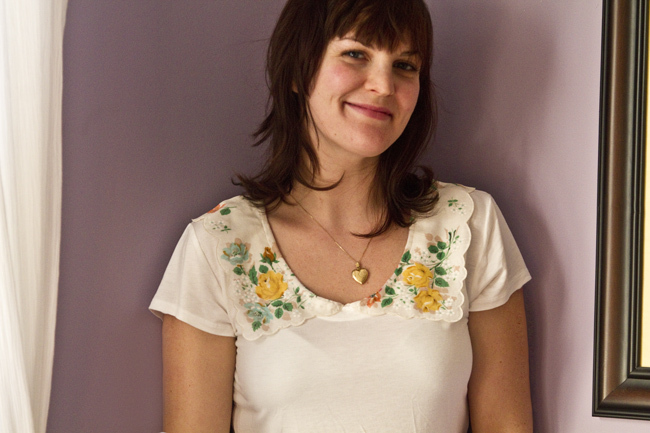 A Google search reveals that I'm not the first blogger to ever repurpose an old hanky as a collar, but this blogger's (from Adventures in Dressmaking) is a Peter Pan collar. Mine's not. What might my collar be called? A Tinkerbell collar? 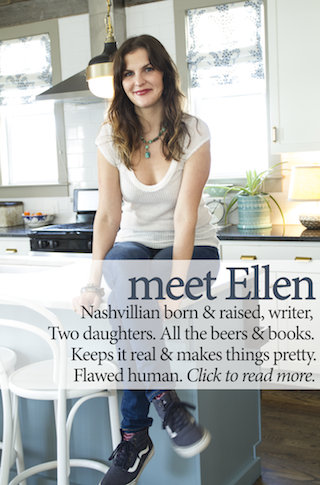 It's a decidedly spring-y project to "spring" on you in January, but it's been a mild winter in Nashville so far, and I'm already fantasizing about the days when the trees, grass and flowers will throw everything back into color. 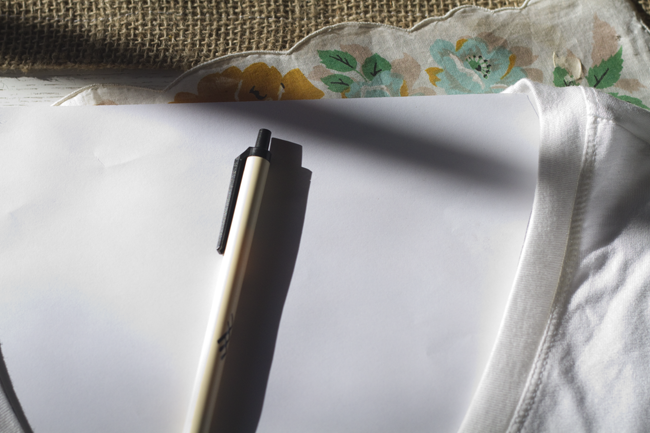 1) Put a piece of computer paper inside your shirt, smooth out the shirt, and trace the outline of the collar onto the paper. Cut out this pattern piece. 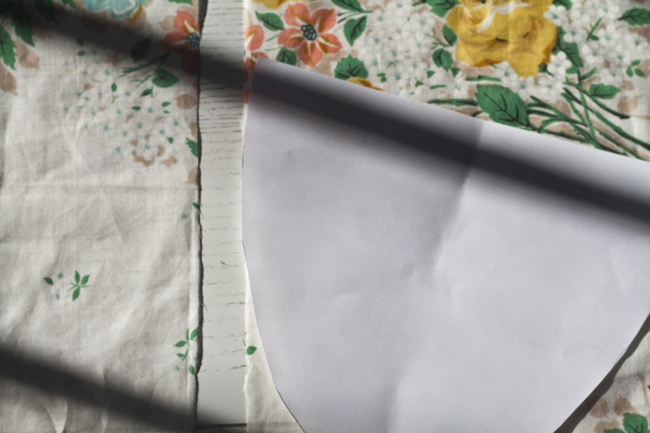 2) Cut your handkerchief in half. 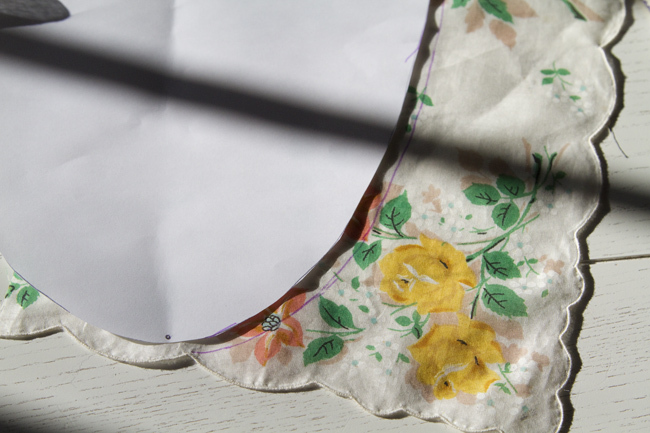 3) Play around with laying your pattern piece over one of the halves of handkerchief that you've cut out. This way you can decide how big you want your collar to be. I put a dot in the bottom center of the pattern piece to remind me to center everything. 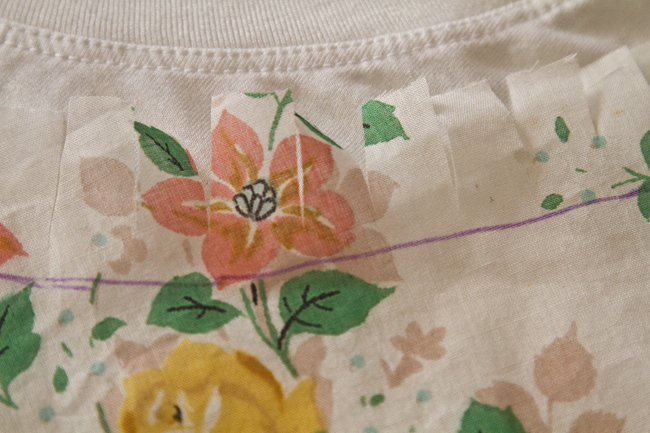 Once you're satisfied with the placement, trace the pattern onto the handkerchief with a washable fabric marker. Duplicate this on the other half of your handkerchief. 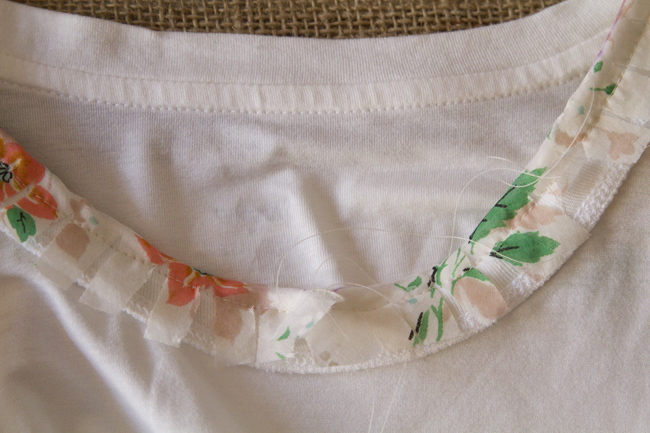 Cut out your collar pieces leaving a very generous seam allowance. 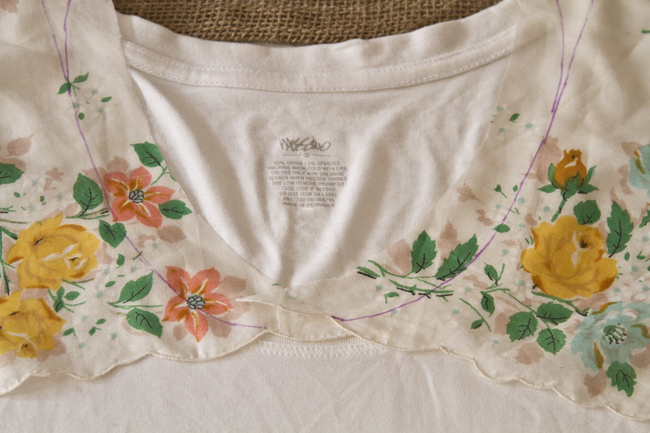 4) Place both pieces of your handkerchief over the collar and make sure your marker line matches up exactly. Mine didn't at the tops so I retraced this part. 5) Clip along your seam allowance every half-inch or so. 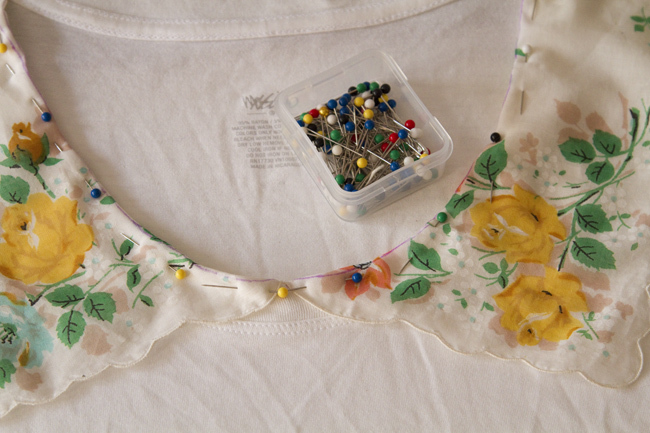 6) Fold your seam allowance over the collar and pin in place. 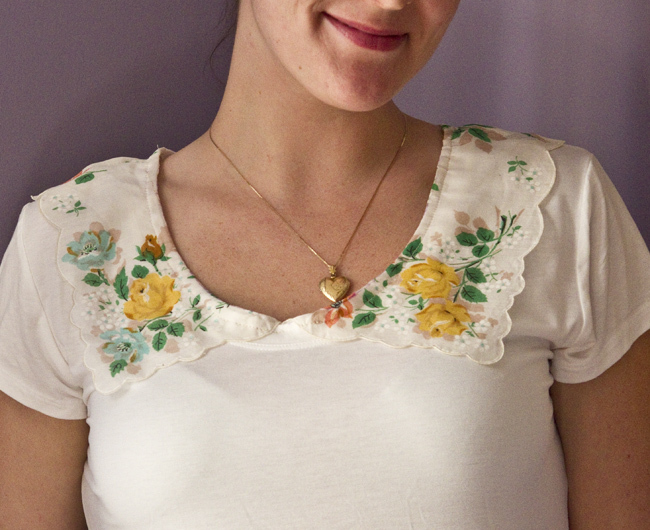 8) Turn your shirt right side out, iron and finish the tops of your collar with a simple hem. I used a couple of hand stitches to secure the collar down at the shoulders. And that's that. Very cute, great way to bling out an average t-shirt! So pretty! And you make it look so easy. I'm not a very experienced sewer, but I think even I could handle this project. So gorgeous! I found this on Pinterest.